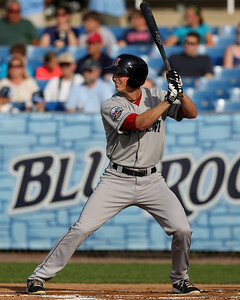 Continuing this year's trend of first time SoxProspect award winners are Salem infielder Stefan Welch (pictured) and Lowell right-hander Ty Buttrey, whom the community voted as SoxProspects Player and Pitcher of the Week, respectively, for this week. Welch, who also won the Carolina League Player of the Week, batted .542/.552/.708 with a home run, double and four walks to three strikeouts in 29 plate appearances last week. Since coming over from the Pittsburgh Pirates system to the Red Sox in June, Welch is batting .330/.422/.428 in 135 plate appearances with Salem. In 84 Double-A plate appearances prior to the trade, the 24-year-old batted .149/.250/.216. Buttrey, a fourth-round pick in last year's draft, pitched 10 scoreless innings over two starts with the Spinners week, while striking out seven, walking three and yielding just three hits. In 24 1/3 innings with Lowell this season, Buttrey has a 2.22 ERA with 10 strikeouts, nine walks and a 1.23 GO/F ratio. The 20-year-old pitched just five innings over four games in the Gulf Coast League last season, in which he struck out five and walked one while allowing one run on five hits.